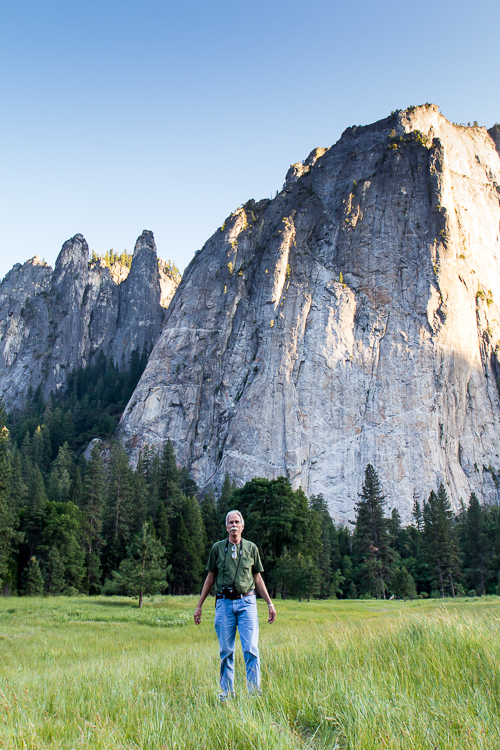 My dad returning to Yosemite Valley, a place he knew well as a teenager in the 60’s. While not everyone grew up in a traditional family structure, this article can apply to anyone who has a loving relationship with a family member who was part of your upbringing. For me, that was my parents, but I recognize that some people were raised by foster families, the parents of your childhood friends, aunts, uncles, grandparents, or siblings. This article still applies no matter who was an integral part of your childhood or who you consider a parent or family. Growing up, my family took a lot of camping trips. We could never afford to take trips outside of North America, so we stuck close to home in the mountains and forests of the Pacific Northwest. Traveling together as a family was such an important part of my upbringing since it taught me a lot about living simply and enjoying each other’s company as well as the world around me. As adults, we carry these memories and values with us, shaping us as travelers, friends, spouses, and lovers. We have our own travel stories that range from road trips with friends, camping trips with spouses, and solo long-term trips abroad that redefine travel for the rest of our lives. However, there is something to be said about coming home and re-experiencing time with our loved ones. Traveling with our families, as adults, kicks this up a notch in a really special way. You may be well-traveled by now, having taken your own adventures, maybe even becoming an expert in the art of travel. You may have surpassed anything your parents may have done when they were younger. You’re the travel expert in your family. This doesn’t mean that you have nothing left to learn from your parents. Taking a trip with a parent as an adult allows your parent to get back into their own travel groove. They’re not tasked with caring for you like they were when you were a kid and this lets them shine in an area they may know well. This last summer, my cousin was coming back to California and I hadn’t seen her in twenty-one years. A family reunion was organized, so my dad and I decided to make it into a camping road trip and stop at many of the national parks on the round-trip trek from Vancouver. I was reminded how good at camping my dad really is. He had packed things that I never would have thought to pack, and those things ended up being small comforts and luxuries that I really appreciated. He even brought small pieces of sample carpet to put in front of our tent doors to help us brush our feet off when getting in and out of the tent. They were all particularly useful things that I’d incorporate into my next car-camping trip. You likely know your parents in a particular context. You see them in their home for holiday meals, you go out for dinner at your favorite Mexican place, or they come over to help you with your taxes. These places and situations have become so familiar that each interaction is usually quite similar to the one before it. The familiarity is comforting and your relationship can become strengthened by this. One thing that may surprise you is that once you exit this context by traveling, you may not recognize your parent or you may see sides of them that have been tucked away for years. Traveling with my dad reminded me that once upon a time, he was a young man who did exciting things. He shared memories of camping with his uncle in the 60’s, setting off firecrackers from the roof, and encountering bears in the woods. These stories didn’t always have a context at home, but in Yosemite Valley, memories came flooding back and I was there to hear about them. If you have had the chance as an adult to travel with your parents, the memories you share will be held dear to you. The snapshots and stories from those experiences stand out in your mind from the rest you had as a child, and your parents will feel the same way. They have an opportunity to spend time with their children in a new and exciting way and they’ll cherish that as well. I not only have the memories of the familiarity and the usual but the memories of an incredible two-week road trip through three states and six state and national parks. I have the wonderful memory of my dad and my husband trying to see who could keep their feet in a freezing river the longest, contorting their faces in pain as I watched and laughed. 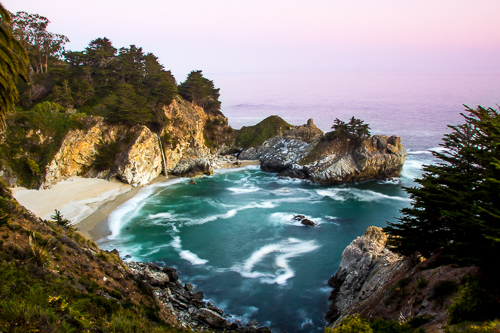 While camping in Big Sur at the beautiful Pfeiffer State Park, my dad and I spent sunset discussing long-exposure photography. My dad was capable of camping, hiking, and driving for days on end, but not all parents are. Travel can still happen in many different ways. For example, a week in Hawaii at a resort, a cruise through Europe along the winding Danube, or, for the more adventurous, even a camel trek through the deserts of India. The possibilities are endless and the memories are waiting to be made! To read more about Maryanne’s travel adventures check out Unknown Home. You remind me of my own such experiences. When I was a child, we lived in a logging camp – so no car. Instead our family piled gear, including the heavy “Woods” canvas tent with aluminum poles, into the boat. Camping took place on one of the nearby islands, with nobody else around. Wonderful memories.